Del Re, Giseppe - interview concerning: Early Ideas in the History of Quantum Chemistry. 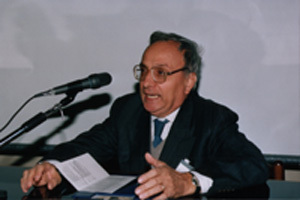 Born in 1932 Del Re graduated in Physics in Florence in 1953 with a thesis on the dielectric constants of solutions. His professor was G. Speroni, a leading Italian physical organic chemist, who, at that time, was trying to measure the dipole moments of molecules via dielectric constants. Del Re attended 1956 Coulson's first or second summer school at Oxford, he visited Uppsala (Lowdin), worked in the US, researched first with Longuet-Higgins, later with the Pullmans and Berthier in Paris. He is the author of the Del Re Method. Became Professor of Theoretical Chemistry at the University of Napoli (Federico II). Since about 1980 Del Re published also in the field of natural philosophy. See also connotationsautobiographical annotations at the end of this page. Anders : Professor Del Re, in 1957 there appeared your first paper 'Sulla struttura elettronica dell'ossido di benzonitrile'. At first sight a paper based on the simple Hückel method yet on closer scrutiny going beyond that due to a different goal. In 1958 you came out with a paper in the Journal of the Chemical Society (London) A Simple MO-LCAO Method for the Calculation of Charge Distributions in Saturated Organic Molecules which established your line of thought in semiemprical quantum chemistry. The SCI indicates that this paper has been cited in over 315 publications in the years 1961-1983. Your method, the so called Del Re Method is still worthwhile thinking about. And only very few people looked into semiempirical methods as critically as you did. For this reason it might be interesting to hear some facts about your thinking as well as your background. Prof. Del Re: I graduated in physics in Florence in 1953 with a thesis on the dielectric constants of solutions. My professor was Giovanni Speroni, a physical organic chemist, who was trying to measure the dipole moments of molecules via dielectric constants. This was how I entered the field of chemistry. I must add - this is just a curiosity - that my interest in molecules came from professor Bonino , professor in Bologna, whose main activity was 1925-1940. He was the one who translated Linus Pauling's The Nature of the Chemical Bond into Italian, and he was the professor of my mother who had graduated in chemistry. So my mother, who was very happy that I liked physics, used to tell me, that one of the newest fields in physics was the application to molecules. So the choice of the field quantum mechanics of molecular structure was essentially a family affair. And I had the luck of finding professor Giovanni Speroni who, though being an organic chemist, was doing work in a field in which a physicist could collaborate. Since Speroni had collaborated with Adolfo Quilico (1902-1982) I consider myself a member of the school of Quilico. Quilico is a person of great interest for Italian theoretical chemistry for he was the founder of a school of physical organic chemistry. In physical chemistry Bonino and Quilico were the leading figures in Italian chemistry. Bonino was more of a theoretical chemist while Quilico was more physical organic chemistry, reaction mechanisms, measuring structural deformations by physical methods and so on. A: Did he publish? Would one find his work in Chemical Abstracts? DR: Of course, but they would be hard to find, because at that time most publications were in Italian. Well, what happened next was that professor Speroni was called to Naples as a full professor of organic chemistry. He asked me whether I would join him to continue my work on the dipole moments of molecules. He suggested that I should graduate also in chemistry, because, if I was going to do research in chemistry it might be better to be a fullright citizen of the chemical world. Thus in 1957 I graduated in chemistry at the University of Naples. This is why I have a background in organic chemistry. A: For many years you then followed up research on dipole moments. In 1957 you went to England, to pursue your ideas? DR: It was in 1956 when I went to the first or second summer school of Charles Coulson's at Oxford. A: In 1958, 1959 you went to Löwdin's at Uppsala to work on the non-orthogonality problem. DR: Yes, that was the subject he was most interested in; and he was working on it at a time when most people were interested in extending the Hückel methods. A: It can be seen from your papers that you then went to RIAS. By the way, what does RIAS stand for? DR: Research Institute for Advanced Studies. As a joke it also translated into: "really, I ain't sure". It was sponsored by the Martin Company , a company making airplanes and missiles. It was one of those attempts to set up a pure research institute on a completely private basis, and with no university activity connections - of course we were connected with Johns Hopkins University in Baltimore, but not officially. That in itself is also a very interesting story because there was always the American idea that one must make a profit, otherwise things would not be worth doing. To make a profit out of pure research was a complicated thing. I think in the end it failed; for a while it was good, since they had some very good mathematicians there. A: And you were leading it? DR: I was just the quantum chemistry group leader there. A: Who did the more technical work, I mean who was doing the actual calculations? Were there technical assistants? DR: In those times we still did the calculations with mechanical machines. As you probably already know, in the late 1950's the diagonalization of a 10 x 10 matrix took about a week. In Uppsala they had a Univac E III computer. That was a computer equivalent to a very good pocket computer of our time. We had a computing center there and could ask the technicians to carry out a diagonalization, but most of the time we did not have such a clear-cut problem. Mostly we had to write the programs ourselves. Later there were attemps to do otherwise, but still the details one did not like had to be reprogrammed. Real progress on that account came with the foundation of the QCPE (Quantum Chemistry Program Exchange) - that was a good idea of Harrison Shull's , who by the way, was in Uppsala at the time as I. At the time there were in Uppsala Roy McWeeny , Shull, myself, G.G. Hall and Preuss. Berthier , with whom I became acquainted in that period, came as a visitor. A: It was a small community in those days and everybody knew everybody else. So you were at Uppsala for a time and then, as can be seen from your further papers, you also worked with Robert G. Parr in the US. You contributed your knowledge which you had acquired at Uppsala? A: But that's quite a distance? A: You mean you went by car, not by train? DR: By car. I owned a Fiat 1100 which I had bought second hand and with which I went back and forth. I often drove at night. I still remember the beautiful rainbow which I often met on approaching Baltimore at five in the morning. DR: Yes. What I essentially learned at Uppsala was all the tricks of the matrix formalism of quantum mechanics. What I most owe to Löwdin is that he insisted so much on matrices, that they became familiar to me at a time when even well known quantum chemists had difficulties in handling that kind of mathematics. A: Back in Naples you then started around 1963 at the "Mostra d'Oltremare"? DR: That was a park where the Institute of Theoretical Physics was located. To tell the whole story: at RIAS I was completely happy except for one problem: I had several children, the oldest one was going to be six. At the time a change of the American school system advocated by John Dewey was already being introduced. John Dewey wanted to exclude all subjects except the 'useful' ones; he wanted no compulsion on the pupils. In the US the school system was being called 'the national baby-sitter'. Seeing that, I was afraid that my children would have to rebuild their education from scratch if I ever decided to go back to Europe. So I thought that I should return to Europe. Consequently I contacted my friend Edoardo Caianiello, an outstanding physicist, well known for his work on meson physics and who was professor at the University of Naples. He invited me to join his group. There I became professor of spectroscopy. I taught spectroscopy for several years and of course I continued my researc in quantum chemistry. A: Around 1963, 1964 you were at Pullman's at Paris? DR: I visited Paris each year for several months, at the Institut de Biologie Physico-Chimique from which Pullman just retired as its director in June 1994. A: You worked with Pullman and Berthier. "In 1952, I started Ph.D. work with Giovanni Speroni in Florence. As a physicist, I was assigned to electric dipole moment measurements of intriguing molecules such as benzonitriloxide. At the time, additivity of bond moments was extensively applied to molecular structures. It soon appeared to me that a stumbling block was that in the case of bonds no account was taken of the specific environment of each given bond. In Oxford and Varenna, Italy, lectures by Charles A. Coulson and Christopher H. Longuet-Higgins familiarized me with -system calculations, and I found that we had there a technique for adjusting dipole moments to the environment. Unfortunately, being localized, bonds could not be subjected to the same kind of treatment. But then I noticed that in the Hückel method heteroatoms were assumed to bring about an 'inductive effect' by modifying the alphas of the neighboring atoms. Why not apply the same idea to systems? "Thus the idea took shape of applying a two-center Hückel scheme of each bond, taking adjacent bonds into account by adjusting the alphas according to the surrounding atoms. As the given bond in turn affected the adjacent ones, an iterative procedure resulted, which turned out to be equivalent to a linear system for the alphas. If suitable numerical values for the parameters appearing in it could be found, there lay a solution to my problem. Eventually, I came out with correct predictions of the dipole moments for many more saturated molecules than the adjustable quantities used. The method worked. "That was in 1958. The next part of the story took place four years later, when I came back to Europe after a stay in America. For a while I was a guest of Bernard Pullman in Paris. It was he who dug out my paper and suggested to Tejiro Yonezawa and me that we apply my method to aminoacids. Only then did the 'Del Re method' start its career. A curious one indeed, as I could see when reviewing the method in 1980. In spite of its simplicity, and in spite of being based on a strictly localized picture of bonds, it gives reasonable charges even compared with ab initio. The atomic parameters appear to be measures of in situ electronegativities. With large molecules like proteins, it is still the only practicable method for electronic distributions." A: Many people mentioned the Del Re method; most recently for instance in Fliszars books of 1983 and 1994. DR: Yes, that method was used in many publications until the computer methods came into usage. The thing was that I was still very young and not much of an expert on how things must be handled in order to 'sell' one's ideas efficiently. Actually the `Del Re method' had remained dormant until one day when I was at Bernard Pullman's Institute. A guest professor there was Tejiro Yonezawa, a collaborator of Fukui's. You know Fukui , the Nobel laureate. Pullman knew my method and said:"Please, help Yonezawa on an application of your method to the amino-acids". So that was the first time the method was really applied. The paper appeared in Biochim. Biophys. Acta in 1963. So the diffusion of the method is a merit of Pullman's, not mine. Pullman knew it and had the intuition that it could be of use in the study of large molecules. A: Professor Del Re, how would you describe the birth of your method? DR: It appeared in the journal of the Chemical Society London in 1958. The story is very simple. I had studied the Hückel method for systems and I knew of Friedrich Hund's idea of tackling bonds by the same method. And also this was in the beginning of theoretical organic chemistry - it was the time when there was discussed the question of inductive and mesomeric effects. And at that point I was working on dipole moments. The application of quantum concepts to dipole moments consists in trying to establish bond moments and then add the electric vectors of the individuals and get the total dipole moment of the molecule. At that time what was used to be done was to take standard values. For instance you had an N-O bond which would always have the same dipole moment, a C-C bond of course would be zero, the C-H a certain standard dipole moment and so on. Now this was known to be an approximation because the bonds would affect one another, a little like what would happen in systems. But with what we were dealing here were the bonds of separated molecules since we already had the Hückel method for systems which allowed, so to say, an estimate of the contribution of the interaction between the bonds to the dipole moment. OK, this paper of 1957 was a paper which considers only the systems and showed - and this may also be interesting - the fact that benzonitrileoxide (BNO) had the same dipole moment as benzonitrile (BN) which could be explained by using the Hückel method. And, what is worth mentioning, it was one of the cases where I was faced with the problems of parametrization. Now, I consulted Longuet-Higgins. A: You simply wrote to him? DR: I had attended a summer school at Varenna near the lake of Como; it must have been in 1956. There I had met Pullman, Longuet-Higgins, Coulson, among others. I had been charged with revising the text of Longuet-Higgins' lectures, which were, by the way, extremely clear. So I had some contacts with him. On occasion I asked him if I could have a talk with him and then asked: "Look, what parameters can I use in an application of the Hückel method to benzonitriloxide?" He gave me an answer which I still consider extremely wise. He said: "Don't worry too much about the parameters. The important thing are the trends. So take the simplest parameters you can find and, if they are not unreasonable, you will get the answer you are looking for." This is what actually happened. Using simple parameters alphas equal to 0 for carbon, 1 for nitrogen, 2 for oxygen, and betas all equal to 1), I found a dipole moment much greater for benzonitriloxide (BNO) than for benzonitrile (BN), whereas in the experiments they were the same; but comparison with pyridine and other N-oxides showed that the contribution of the N-O bond to the dipole moment of BNO was much smaller than that computed for pyridine N-oxide. So the computation showed a trend towards a decrease in the contribution of the N-O bond, and supported the conjecture that the low apparent electric dipole moment of the N-O bond in BNO was a pi-back-donation effect. It was evident that by choosing specific parameters one would have the experimental result. But that was not the important thing. The important thing was that I realized that there was the explanation of the experimental results in terms of a pi-effect. A: The result of the calculation and the view of organic chemistry agreed. DR: There was a bifurcation. You have to check by asking directly Longuet-Higgins, if you happen to meet him, but I am sure that he believed that, after all, the important role of semiempirical methods was to obtain qualitative answers to guide the explanations. And probably he was not particularly happy with what happened later, with people fighting to get parameters which would reproduce quantitatively the experimental results. As to myself, perhaps because of my education as a physicist, I was never convinced that the latter was a good choice. If you use a method which does not take account of everything in a molecule you should not demand results matching completely the experimental results. If you do, and over-parametrize, it means that you are using the method as an approximation which does not contain certain quantities which must be there. That is to say: as an interpretation and approximation method, a simplified procedure is all right; but if you try to force it to give exact experimental results, you really do something theoretically unjustified. This sort of work was done all the time after 1955. From the point of view of science, it was useful because there remained the possibility that agreement with experiment resulted from cancellation of certains effects or from tacit assumptions. Therefore, it gave rise to a great discussion on why it worked and the extent to which it could be taken seriously; Löwdin's famous work on the non-orthogonality problem is a case in point. However, by and large, the general opinion was that those `accurate' semiempirical methods worked because they were interpolation procedures, and interpolation procedures always work if no strange cases occur. If you take all the substituted benzenes you can always interpolate, but that does not prove that the method you are using really takes account of everything. So, I think, it was at that time when there was that bifurcation between the physicist's approach trying to understand even by rough estimates and the chemist's approach, based on the 'yield', i.e., accurate results. In retrospect, I have nothing to say against those, like Dewar, who tried to adjust parameters, then abandoned the Hückel method and went on to other methods. Their merit is that they have provided programs which give surprising good predictions. Maybe that was a good thing after all. But at that time there was only this alternative: using the method for interpretation or forcing the method to give complete agreement with experiments at the price of putting in a number of parameters. DR: Yes, but already with the Hückel Method there was for instance Orgel's parametrization, which gave good results. Unfortunately. in order to compute dipole moments you had to divide all the charges by 1.4 - why not 1.3 of why not 1.5? It was simply an empirical recipe for which perhaps we could find some a posteriori justification by showing that, say, correlation effects or some other effect would reduce charges proportionally to what they were. But certainly that was not contained in that method since it was just a recipe for determining dipole moments. Neither was it a way to understand molecular reality. Well, the discussion is very complicated and perhaps I am now forcing the issue a little but indeed there have been those two views. Coming to my method, I was wondering whether we could not do on the sigma bonds of saturated molecules something of the same kind as I had done on the pi-system of benzonitriloxide. I was studying organic chemistry at that time. I was strongly interested in theory. I noticed that a strict distinction between the mesomeric and inductive effect was being made and I thought:"Well, there we have the answer: I take Hund's scheme, in other words I take each bond separately and apply to it a method of the Hückel type. However, inductive effect means that the each bond somehow modifies the properties of the atoms of neighboring bonds." Of course, there existed other papers, especially on polarization, there were attempts to determine inductive effects via charges in chlorides - they must be cited somewhere in my papers. They gave me some ideas and finally I decided that I would assume that it was the electronegativity of each atom which was modified by the presence of the different bonds. And so I gave a formula which had two steps: one was to compute the atomic parameters so as to take into account that each would be modified, and of course also modify the others, simply by a linear contribution. So one could consider how many atoms there were around a given one, and then add a fraction of their electronegativity to the electronegativity of the central atom. In that way, all the atoms would feel the environment, and the more neighboring atoms there were, the larger the electronegativity of that atom would become, since it would try to keep its electrons. If you put, say, a C near a C, well, nothing special happens; but if you link an O to a C, the O tends to pull electrons, the C tends to become positive and as a consequence it increases its electronegativity. This electronegativity adjustment comes not only from that one bond but also from all the other bonds. So the other bonds are affected, too. If in a molecule you replace a C-C bond by a C-O bond it means that the remaining C becomes more electronegative; this affects also the other bonds formed by that C. So you have a trasmission of this effect. So that was the idea and, well, then I had the problem of the parameters. It was necessary to give them values. Of course, the problem was not as simple as in the Hückel method. Moreover, since I was interested in computing dipole moments, I tried to get some agreement with experimental data. In contrast to what I have said above, in this case my interest became one of getting a tool for using dipole moments and so I shifted a little to the other camp. This meant that I had to decide what parameters I should choose. Finally I asked again Longuet-Higgins about his opinion. In this case he was typically English, for he looked at the practical side of the story. As far as I remember, his general comment was: "What matters is that the method works. You need only make an application to some quantity other than dipole moments". And he suggested I should apply the method to quadrupole coupling constants, something which pleased people. If I had to add some anecdote I might add the following: It was the first paper in English which I submitted personally, moreover to a journal of which I knew nothing. I sent it to the Journal of the Chemical Society (London) and nothing happened for a while. Finally it was accepted, and I was so glad that I did not read carefully the letter of acceptance. Years later I found that letter again: it said that, because of disagreements among the reviewers, the editorial committee had met and discussed the paper and that in the end they had agreed to publish it. That paper then slept for several years until Pullman realized how it could be used. Then it was used for a long time indeed. For two reasons: first, it was not easy to get methods for _ systems until the CNDO methods were made available. Secondly, it was used in some countries where computers were not readily available or where they were too expensive; they would use my method because it was easy to apply. In general, it was useful for very large molecules; one of the applications was for instance by Scheraga, an expert on the conformation of macromolecules who needed estimates of atomic 'net charges'. In retrospect, it is comforting for me to see that between my method and more sophisticated ones no serious disagreement has been found. Or better: those disagreements which have been found have been solved so far in favour of the simpler method. The reason for this does not lie in some extraordinary insight. It is very simple: fundamentally mine is a method which involves a linear formulation of the SCF mechanism of adjustment of the charges of atoms one to the other; moreover; since it is based on dipole moments, it gives charges that are comparatively realistic. If you take ab initio STO-3G calculations you find charges which follow the same pattern, but are several times my values. If you go on and improve the computations they tend to become smaller. DR: ...sufficiently realistic. But I must add that behind this, there is a question of definition of atomic charges and this is still now (1994) an open question. A: In 1974 you wrote in Advances in Quantum Chemistry, Vol. 8, p. 101: "Therefore, by and large the situation is not clearer today than it was 20 years ago..."
DR: Well, you see, here you touch on an extremely important problem of present quantum chemistry. It is that people are less prone to do what they would call 'philosophy', trying to set down clearly what they are doing, why they are doing it and so on. And the philosophy of 'it is good because it works' has become more and more popular. DR: That is interesting as a numerical investigation into the techniques for solving the Schrödinger equation. But it should not be called `research in chemistry', and should instead be called `research on numerical treatments of the many-body Schrödinger equation'. That, of course, is extremely important for chemistry. But when it is maintained that that is actually chemistry it may become dangerous. Because that may orient research, especially by the younger people, in a direction which is interesting but which treats as a research objective what (in chemistry) should be just a means. As I have mentioned, I think this is why organic chemists - as you probably know - are dissatisfied with quantum chemistry. A: The group of the 'calculators' misusing chemistry as a basis for their calculations? DR: Well, yes. Now the situation has improved somewhat. But there has been a period when, if you didn't do ab initio calculations at a very high level, your paper would not be published. If you did any calculations on molecules the paper would go to a referee who did larger calculations. And he would say that it was no good because the method was too simple, without any further examination of the paper; he would simply disregard the rest. A: Your opinion in the time 1980, 1984? DR: I will also give recent references on what I am saying: --The relation of chemistry to other fields of science: Atomism, reductionism, and the inversion of reduction--, Epistemologia (Genoa) 1987, p.269 and --The historical perspective and the specificity of chemistry--, Epistemologia 1987, p.231. My present opinion is that, if you want to use quantities like atomic charges, you have to give their physical meaning. Now, is this possible? At first sight one thinks not, and so did I. But then I tried to see if the partitioning of the electron cloud into atomic populations could be associated with some physical aspect, or, let us say, some physical model of a molecule. Because then one could say: all right, the charges I am using have a clearcut meaning in the model of a molecule I am using. For example, it is possible to justify the use of what Mulliken called gross atomic populations and the charges derived therefrom by referring to a one-electron operator, the electrostatic potential or maybe the electric dipole moment, and applying Mulliken's approximation for the products of orbitals to the expression of the expectation value of the observable resulting from a Hückel-type orbital scheme. If you use a one-determinant description of the electronic state of the molecule the one-electron operator comes out to be the sum of the contributions of the different molecular orbitals. Now, if you expand this (of course using Mulliken's approximation) you find that in fact the - say - electrostatic potential generated by a molecule, at a certain distance, is the sum of point charge potentials and those charges are exactly Mulliken's net charges. So Mulliken's net charges correspond to a model where the molecule is described as a system of point charges, with the assumption that the atomic orbitals obey Mulliken's approximation for orbital products. That is an illustration of my contention that, if you define correctly the model you are using, and the approximations you are using, then you can give a physical meaning to a charge. Allow me to insist on this point with reference to the example of Mulliken charges. Once you have proven the above points, you can claim that, as long as Mulliken's approximation is considered valid and a signle-determinant description of the molecular state of interest is adopted, then the one-electron electron operators can be represented in terms of net charges, let's say of charges associated with individual bonds and located at the nuclei. And those point charges are precisely Mulliken's charges. At this point Mulliken's charges can be used as tools for explaining features of molecular reality. Of course one can always remark there is electron correlation, that it is not accurate (and sometimes not legitimate) to use a single determinant. But at least we have stated what is the . ning of the charges, and the limitations are perfectly clear. Therefore, one has complied with the requirement of constructive scientific honesty if one then proceeds to compute the dipole moment and the electrostatic potential of a molecule with Mulliken's charges. Then maybe one can discuss the corrections to be introduced because of the corrections made. But what has beeing done is not just like chopping the electron cloud into pieces in an intuitive manner. It corresponds to something physical. A: In this calculation you leave out things like the exchange integrals? How would you, by the way, suggest to visualize an exchange integral? DR: Well, I must answer in two steps. First, as long as I take a pure one-electron operator there is no problem of exchange, although it may arise in many other cases. And then, secondly, concerning visualization: John C. Slater tried to give a visualzation by speaking of an "exchange hole". He expressed the potential generated by an electron around itself so as to introduce what is called an exchange potential and in that way, although from the mathematical side it was very clumsy, he had a potential which included exchange. I think this is the best one can do, for exchange is a typical quantum effect which cannot be visualized better than that. I think it's in his book on the theory of atoms where he speaks of the SCF method. A: So one could say the semiempirical people would always stick to something they can visualize? DR: Well, largely yes. However, I was even going further than that. I was speaking of making a correspondence between the models we are using with a physical quantity. You see there is a previous story which goes back to Platt who, as you may remember, invented the expression "the plague of non-observables". What was the claim of Platt? Platt started with the remark that one cannot speak of what is not observable. Physics accepts this and therefore I do too. Of course it sounds very much like Wittgenstein, if you apply that idea outside science, but that is a different story; I can still believe in God, who is not observable, because theology is not an empirical science. So within science Platt was right. But then he went on to say: "you cannot speak of charges because net charges on a molecule are not observable. How can you measure them? You can measure dipole moments but not the distribution of charges". And, to make a long story short: one day, at a conference, I got up and said: "Look, if you examine the way in which we determine the 'observed' energy of a molecule you will find that it is so complicated and it takes so many intermediate steps that, if you follow Platt's idea, energy is no longer an observable. So as a consequence let's stop using energy values." There was a sudden silence in the audience. I think of course that thus I made some enemies. The point is the following: it is true that we should not introduce non-observable quantities. But to be observable they only need to be connected in a unique way to an experimentally observed effect. In the case of atomic charges, those who agreed with Platt were mistaken, because it is possible, as I have just said, to show that under certain conditions you can reproduce an observable quantity, the electrostatic potential for instance, with one and only one choice of these numbers. So in essence, you can get a test of your charges by measuring the potentials. Of course you have to make assumptions, you always have to make assumptions of some kind. If you don't accept this kind of observability then, as I have said, you have problems even for energy, because you always go through a theory, you make some assumptions and then you make a theoretical analysis, before being able to say: "If the instrument gives this reading then my quantity has the following value." So, for instance, I could, in principle, by using my definition, measure the electrostatic potential of a molecule at a sufficient number of points in space and I will have equations which give me the charges. Then they are observable. If I don't admit Mulliken's approximation and orbital scheme then the problem is that there may be several charge definitions which can give the same electrostatic potential. Then they are not observable, for they are not uniquely defined and their physical significance, is not quite clear. But as long as you have a model and a method - a model involving uniquely defined point charges and a method, a scheme, to compute them, as long as you can show that they give one and only one electrostatic potential and viceversa, then they are observable. A: Is the Hamiltonian then part of the method? How would you prefer to define 'model' and 'method'? DR: That is a good question. I think one has to make a distinction with respect to what could be called a 'mathematical model' and which is just a mathematical scheme, as the hydrodynamical model of the electrostatic field. There are models which I would call "physical models", which can be taken at several stages of computation. You can take a molecule and forget about certain details of reality, for instance forget about nuclear motions. Then you are making a physical model of the molecule, and this comes before your computation of the electron distribution. It comes before the Hamiltonian, for the Hamiltonian needs a description, a statement of what the particles are; and when you make the Born Oppenheimer approximation and forget about the nuclear motions, you no longer have the nuclei among the particles. So you can have made a model in the sense that you have taken a system which is not the real system but one which you expect to be equivalent to the real system within certain limits and certain respects. A: Thus the molecule is something physical to which you can assign, unambiguously, a mathematical apparatus? DR: That's one way. But I think one could use the same idea also at another stage. The model I was thinking of is used before setting up the equations. Another possibility is the use of a simplified physical model to develop the interpretation of the results. You could say: I take the whole molecule with its nuclei, correlation and everything and I have a wavefunction and then I work on the wavefunction to derive from it a model. That is to say: in the first case you choose the simplifications before making the computation; in the other case you introduce new simplifications only afterwards, on the wavefunction. A: I take 15 terms, leave out 7 terms and I get a simpler wavefunction? DR: Exactly. In the case of charges one should speak of a population matrix rather than of a wavefunction. But it's always in view of a calculation, of course. And you introduced your simplifications at a certain stage after having already gone a good part of the way. In my opinion it does not change the nature of the problem. It is a simplified physical system which you are using as your reference system for your interpretation. And the justification of using models is that they are not completely fictitious. It is not like when you make a drawing of a butterfly and call it a model of a butterfly. It is not like that. It is as if you made something which behaves more or less like a butterfly but without the details: you can still say that you are dealing with the real object up to certain details. Then it is a physical model. Another case in point is the story of reactivity indices. You know there was a time when in semiempirical methods one would speak of "free valence": that is an example of a now obsolete reactivity index. Now, can one really define a reacting index? Well, in order to define one, you have to imagine a physical situation. This I discussed with Bob Parr. But Parr does not think along these lines. He thinks in terms of equations, and so, in a discussion of about ten years ago, we could not get to an agreement on something like this. He is interested in getting definitions of the reactivity indices and all that from mathematical treatments. He says: "Let's define an index, let's determine its properties from a mathematical treatment." He has been using the density functional method with that aim. However, we couldn't agree on the point that, if you think, for example, of electronegativities you must tell what kind of experiment you will make in order to 'measure' them. That is to say, when you define something you have to provide at least some sort of `Gedankenexperiment' by which it can be measured." Of coursde, I may be mistaken. At any rate, in the case of reactivity indices I have attempted to work a definition out of a specific physical situation. Without going into the details let me say that, when you consider a concrete situation, albeit idealized, you may find interesting differences from what your intuition suggested, e.g. second derivatives rather than first derivatives. DR. They have an inbuilt contempt for what they consider 'philosophy' which is not philosophy at all, it is just an attempt to understand a formula. No one is obliged to do metaphysics, but everyone is supposed to understand what is happening - and they dont't like it. Perhaps identification between understanding and predicting is an Anglo-Saxon attitude. I am afraid that it is doing great damage especially in theoretical chemistry. The fact is that if you want to understand you need general rules, so as to be able to say: this happens because the following rules combine in such and such a way. A: So you say semiempirical methods are not out? DR: No, they even come back a little, which is, in my opinion, the merit of R. Hoffman. From what I know he won the Nobel prize essentially because of support from the organic chemists, precisely because he applied his extremely simple method, the Extended Hückel 'theory', to get rules like the Woodward-Hoffman rules. Those rules could be derived just by symmetry considerations, but that's irrelevant; what is important is that Hoffman was looking for general rules governing the reaction mechanisms. He was trying to understand, to get tools at least to understand reaction mechanisms. And in that sense it is very right that he got a Nobel prize. There were other people who really were very much surprised and said: "There are other quantum chemists who have done more." Maybe they have done more, but nothing that could be of real use to the advancement of research, at least as far organic chemists are concerned. Because they were not trying to understand what was happening but simply to predict. And the organic chemists are mainly interested in knowing what kinds of general rules govern similar reactions, so as to be able to choose beforehand which kind of molecules could prove interesting. In that connection, accurate computations could always help, but theirs would be a minor contribution. A: The chemist has the compound on his hands and then the theoreticians come and start their calculations? DR: My feeling is that chemistry is not a chapter of physics precisely because real chemistry is neither computations nor an application of physics. Because what the chemist practices is stick-and-ball-model thinking and there he does not even need energy. For he always knows the rules which make one bond weaker or stronger, the general properties by which one structure can be transformed into another. I am referring to reaction mechanisms, say, in the sense of Ingold. Details, energies and geometries can certainly help, but fundamentally one knows that certain bonds are weaker or that certain bonds are sensitive to nucleophilic agents, other bonds are sensitive to electrophilic agents, etc. That's all you need. In that connection quantum theory is a tool to get information, not an explanation theory. A: Maybe one day one can look at an isolated molecule, at its chrages in the sense that they now look at an isolated atom confined intraps, or look at it in the sense of Aspect's experiments? DR: I think you have a point there. But one must actually find out where the analogy applies. Consider the nonlocality problem. You can find it in the question of what happens when you take two hydrogen atoms very far apart. Are they still bound to one another or not? In chemistry you too have this problem. In other words: what happens when you go to the limit of a large distance, considering two orbital electrons which where correlated with opposite spins? Are they still of opposite spin or are the spins uncorrelated? So indeed cases of that kind do exist in chemistry and they might even have some importance. But generally in chemistry you always have perturbations which destroy any correlation over a certain distance. When the atoms are a certain distance apart then the problem becomes irrelevant to chemistry. Not that it does not exists, only it's not relevant; whereas the physicists, who are interested in general laws, try to examine cases where that special ossibility is actually relevant. They eliminate all possible perturbations, they experiment in such a way as to exclude randomization of the interactions and other related effects. Then of course they try to decide whether or not the EPR paradox holds. Herein lies the difference between chemistry and physics: the physicist is interested in a fundamental law; he makes experiments to see if the law works one way or the other. Chemists in most cases have similar problems but these are purely ideal and we are not interested in them, because in our activity as chemists it never happens that two atoms dissociate spontaneously without being affected by perturbations which actually destroy their correlation. I think you are also thinking of more general cases where there are situations analogous to that but not concerning the correlated behavior of electrons. There I cannot give an answer. I should think, anyway, that the place of quantum mechanics in chemistry is extremely limited, except in photochemistry. That is still an open field. We are now working, for instance, on the theory of time-dependent phenomena in molecules. There we have to deal with a really fundamental problem in quantum mechanics, the problem of coherence, which is related to the nonlocality problem. DR: It is interesting in this context to think of Sir James Jeans , a well-known physicist of the turn of last century and of Werner Heisenberg. At least according to the Italian translation of his book, Jeans did not mention in a short hystory of science of his either Kekule or any other great chemist of the second half of the XIXth century. As to Heisenberg, he thought that chemistry had brought the atom to science and that thereafter it had merged with physics into quantum mechanics. This clearly shows that Heisenberg - such a great man - had not understood that chemistry is not the science of atoms but rather the science of molecules - the atom being the 'elementary particle' of chemistry! He was right in saying that the science of atoms had been absorbed into quantum mechanics. There was no longer any reason to have a science of atoms, that's true. But chemistry is not the science of atoms. A: Do you think that there could be a book on semiempirical methods in between technical and epestemological aspects of science? DR: Yes, all you have to have is a thread. I think perhaps something like sticking to the specificity of chemistry, in other words speaking of what the problems of the chemists really are. In my opinion that could be one "Leitmotiv" - of your book. Because then you could also render a good service to research in chemistry. We cannot continue in this way. There are people who work full time in computational chemistry. But for the younger people just to work with the computer and never to try to find out what the problems are, what the chemists really want to know, that is very problematic. I have examples which I consider sad because it's a waste of intelligence. People beginning work in theoretical chemistry only with computers detach themselves from chemistry and then don't go back. For them there is nothing more to know. I have always had a hard time trying to convince my students that they should not use the computer too much lest they should become addicted to it. But then I myself sometimes go to the computer to see what happens in some specific case, and I spend hours playing with it. It's so much more entertaining than writing a paper. A: Professor Del Re I thank you very much for this highly interesting and extended (2.5 hours) interview. ---professore ordinario di Chimica Teorica presso l'Università di Napoli "Federico II"
--- membro dei comitati scientifici delle Riviste "Advances in Quantum Chemistry" (Gainesville, Florida, USA), "Hyle" (Karlsruhe, Germania) "Filosofia Oggi" (Genova), "Nuova Secondaria" (Brescia), "La Nuova Critica" (Roma). --- la traduzione, con introduzione e note, di un libro di T. F. Torrance sulla filosofia della scienza ehe emerge dal lavoro di Einstein e Polanyi. --- (d) ANALOGIE E MODELLI NEL METODO SCIENTIFICO. QUESTO ARGOMENTO È ATTUALMENTE IL SUO PRINCIPALE CAMPO DI INTERESSE. È stato docente dei Corso di Perfezionamento in Neurofisiologia degli Stati di Coscienza presso l'Università La Sapienza di Roma. È stato professore invitato in Canada, USA, Germania, Francia, Algeria, Argentina. Il suo ultimo impegno di ricerca e insegnamento all'Estero ha avuto luogo presso la Scuola Normale Superiore di Parigi (ENS), su invito di questa. Ha partecipato all'organizzazione di numerosi convegni culturali a Napoli, ha tenuto conferenze a Milano, Torino, Broscia, Trieste, Pisa, Pistola, Napoli, Battipaglia, ecc. Something additional: Arbeitskreis Philosophie und Chemie/Chemie und Reduktionismus Workshop/ Universität Konstanz/ 15. - 17. Juni 1995. To read this, Click here.